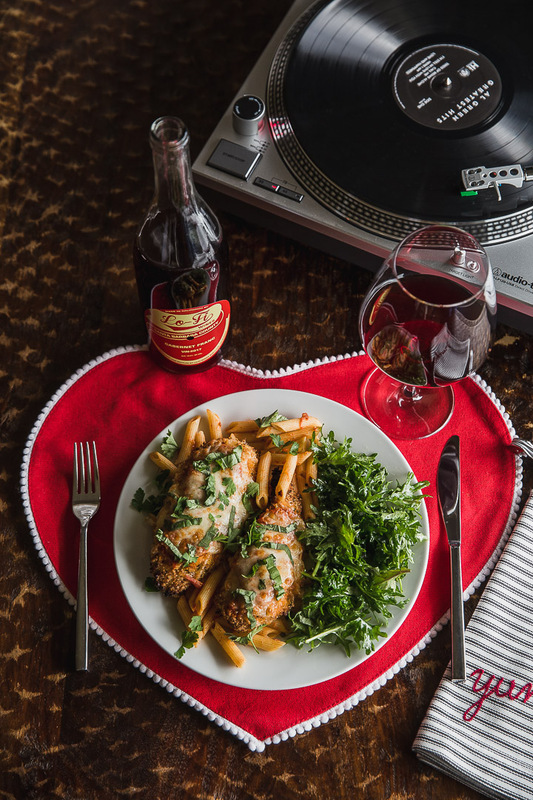 We are so delighted to be sharing this heartwarming Valentine's Day recipe that pairs perfectly with the Cabernet Franc by Lo-Fi Wines. Head over to Brix + Barrel to purchase this bottle to complete your romantic Valentine's Day night in. 1. Heat oven to 425 degrees. Prepare sheet pan with foil. Spray sheet pan with cooking spray. 2. Use 4 chicken cutlets or 2 breasts cut lengthwise into cutlets. If one end of the chicken is very thick then place breast in ziploc bag and pound with mallet until the breast is even in thickness about 1/2 inch. 3. Prepare your dredging stations. The first station with flour mixed with salt and pepper. The second station with 2 eggs mixed well with the juice of 1/2 lemon. The third station with panko, parm, parsley, lemon zest, salt and pepper. 4. Begin dredging chicken in flour mixture, shaking of any access. Then dip in egg mixture, then into panko mixture. Please chicken on rack and then into oven. Bake for 12 minutes on one side, and then flip for 12 minutes on the second side. 5. While chicken is cooking. Boil pasta, when done drain well and mix with marinara. Set aside. Toss fresh arugula with the juice of the other half of your lemon, olive oil, salt and pepper. 6. When chicken is done, remove from oven and turn on broiler. Add 2 tablespoons of marinara to each breast and top that with cheese. Then broil until cheese is bubbly and lightly browned. 7. When chicken is done, remove from oven. Assemble plate with pasta, topped with chicken and great side of arugula. Sprinkle with fresh parsley and basil.